I love notebooks. Actually, I love all stationery products, but there's something about a brand new fresh notebook that I especially love. So when I got cancer and knew I'd have to keep careful notes of all sorts of clinical things, I took it as a perfect time to buy myself some new notebooks. I found this image on a greeting card and loved it. I cut it out and taped in onto the opposite side of my little notebook. Today, there was nothing more appropriate than this message. Because today, I totally freaked out and really wanted to throw stuff. At the time, I couldn't find much to throw except for my work bag into the back seat of my car. But it was too heavy to throw, so that sucked too. As I've mentioned before, my work colleagues have been nothing but absolutely remarkable in supporting me through this ordeal. Technically I am on medical leave until February but I have gone in to the office sporadically and until last week, I was hoping to start taking on more work. But after my allergic reaction, everything changed and I can't seem to muster up the physical or the mental energy to take on work projects. I marvel at the people who manage to hold a full-time or even part-time job through this process, because I honestly don't know how they do it. Last week, with huge reluctance and ambivalence, I handed back a project that prior to my diagnosis, I'm sure I could have completed in a few hours. But last week I just couldn't do it. I tried at all different hours of the day, so frustrated at myself each time for not being able to focus. Not surprisingly, when I admitted defeat, the wonderful partner for whom I work sincerely thanked me for what I had done (which was basically nothing) and wished me all the best. I hate admitting defeat like that but in a way, it was a victory that I did. And it was a great reminder that I work with people that care first and foremost about my well being. That's an awesome victory, too. While I'm totally replaceable on my corporate work (in fact, my fabulous friend, Andy, who recently joined our group could certainly do a better job than I could), I have two pro bono clients for whom my presence actually matters. One is Julia, who I have written about before, and the other is a client that I'll call Wendy. I have worked with Wendy for quite a while now, and like Julia, when I left Ropes, I couldn't leave her behind. This upcoming February, I will join Wendy and my great partners on her case to go before an immigration judge to prove that Wendy deserves asylum in this country. We will show what I believe in my heart to be true -- that if Wendy is sent back to her home country (in Africa), she will be seriously harmed or even killed by brutal and corrupt government forces. And we will pray that she is allowed to stay in the United States. Since Wendy's hearing is fast approaching, we need to file all of our documents with the court soon. So today, I went into work with two goals -- one, to meet with Wendy to make some serious progress on her case, and two, to get in touch with Dr. Bunnell so that I would have a plan for my next treatment. After an hour and a half of traffic (my family insists that I avoid my usual commute on the commuter rail and the orange line until I'm done with chemo), I arrived at my office. Task number one went great. Wendy and I met for three hours and covered a huge amount of important ground. I adore this woman, and her strength and courage give me perspective when I've lost it. She thinks I'm helping her, but really, she has no idea how much she's helping me. Task number two was a different story. At noon on the dot, I explained to Wendy that I needed to call my doctor. She waited patiently while I left a message for Dr. Bunnell. By 2:30 my meeting with Wendy had wrapped up and I hadn't heard back from the doctor. I started to freak out. I tried calling Dr. Bunnell again but hung up after I heard the rings click over into the general breast oncology answering service at Dana-Farber (sometimes his assistant will pick up before the rings click over to the general answering service). I tried to distract myself, but I started to panic. I decided to send Dr. Bunnell a message through the Patient Gateway system which is the online system that the Partners HealthCare system uses to electronically communicate with patients. When I logged on, I noticed that there were two new appointments -- both at "The Allergy Center at 850 Boylston Street" -- on November 13, 2012. I glanced down at the date on the corner of my screen. November 5, 2012. My heart and my stomach sank. Then I really almost lost it. I wanted to freak out and throw stuff like never before. How the f*&% am I supposed to wait a whole other week, powerless and defenseless, while this enemy sits, or even strengthens, inside me? I had to leave work, and I did, without saying goodbye to anyone but Andy, and he sits right by the side door out. At first I felt so badly sneaking out that way but another part of me was too upset to care about anything. My Mom called as I was getting into my car. With an ear to listen, I freaked out even more. I think I even swore, which I never do in front of her unless I'm joking about something. But I wasn't joking. I was having a complete meltdown. My Mom talked me down from the ledge, so to speak, and convinced me to call and leave another message saying that I needed to talk to Dr. Bunnell or Danielle today. I called, and when the breast oncology lady asked me if I was having symptoms (one of the first questions they always ask), I said I wasn't having physical symptoms but I was having mental ones and I really needed to talk to someone today. I was partly kidding but partly not, and I didn't argue when she told me that she marked my message as urgent. The numbness set in again on the ride home. I haven't felt that down since before my surgery. 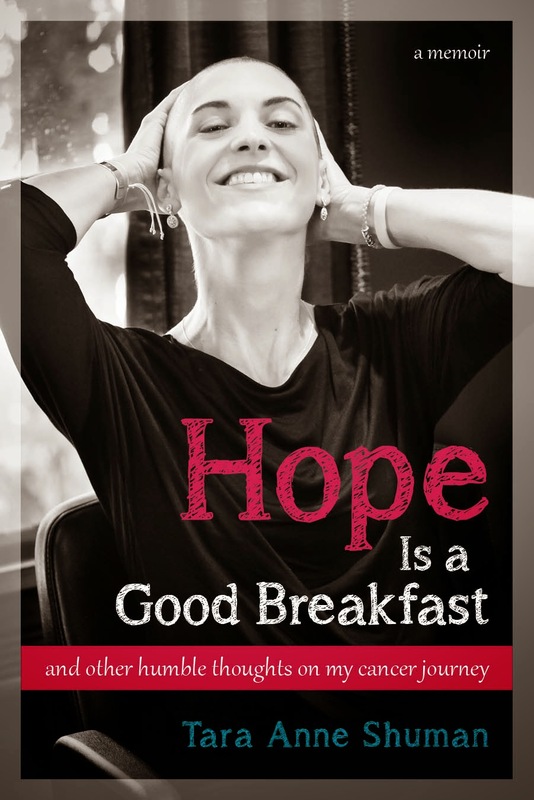 I felt crushed, deflated, and despite all my talk about courage last night, I felt less courageous than ever before. A few minutes after I got home, Danielle called. She apologized for the delay, but I wasn't in the mood to say it was OK. I just listened. She said something about how it's hard to set up my next appointments because there are lots of people that need to work together. Then she explained that while my precise appointment time is not set yet, I should plan to come into the Brigham on Monday November 12 for a "skin test." (I still have no idea what the November 13th appointment was all about.) Danielle explained that the allergists there are going to put a small amount of Taxotere under my skin to see if they can determine whether it is safe for me to continue with this drug. She anticipates a reaction, but it will not be "systemic" like the last one. If the reaction is small enough, I will go ahead with the chemotherapy via the desensitization process the next day, a week from tomorrow. If I react badly, we need to figure out other chemotherapy drugs that will work. The wait exists because they can't do the skin test until ten days after my reaction. Awesome. Danielle said that she and Dr. Bunnell have hope that I will be able to continue on the Taxotere. If I do, I will receive it in the Brigham & Women's ICU because I will need a one-on-one nurse during the course of the entire, long, infusion. At first, the thought of being in the ICU terrified me. But then I realized that there's probably no safer place to be. So now I have a week to hope and pray that next Tuesday, we'll head into the Brigham & Women's ICU for Round Two-B. After I hung up with Danielle, Brian and I took the kids on a fun family trip to his doctor so he could get medicine for the poison ivy that currently covers both of his arms. It turns out that the tree that fell just beside our house during the hurricane was covered in poison ivy vines and during Brian's chain-sawing efforts of last week, he wasn't able to avoid it. I can hear him itching it now. Gross. I offered him my steroids since I don't need them anymore but he declined. How wasteful of him. We joke that the poor guy isn't going to get any sympathy no matter how much of his body is covered in poison ivy. Darn wife-with-cancer-thing, I guess. So much for me trying to find courage this week. I set my goals way too high. Because today, it took all I had in me to avoid a complete and total mental breakdown. I avoided one, but it was touch and go for a while there. To be honest, I may have had one if I had more energy for it. I'm setting my goals lower tomorrow. I'm going to get the kids to school and maybe try to watch the rest of Season Two of Homeland OnDemand. Sorry all, I have nothing inspirational to share. 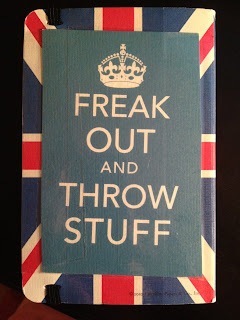 I just want to freak out and throw stuff, including my stupid notebook that says to Keep Calm and Carry On. Because seriously, couldn't I just be allergic to something I could avoid? Like peanuts? Actually, forget it, that must be awful too. Sigh. Time for Homeland. Just read this quote, after an exhausting and frustrating day at school (and the work is still not finished) and made me happy and hopefully could work for you! "An arrow can only be shot by pulling it backward. So when life is dragging you back with difficulties, it means that its going to launch you into something great. So just focus, and keep aiming."